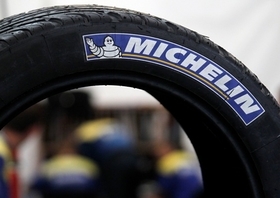 PARIS -- Michelin & Cie., the world's second-largest tiremaker, said first-quarter revenue rose 28 percent, led by surging demand for specialty tires to equip construction equipment and agricultural vehicles. Sales advanced to 5.05 billion euros ($7.36 billion) from 3.94 billion euros a year earlier, Michelin said in a statement Tuesday. The company forecast a full-year volume gain of at least 6.5 percent as the economic recovery boosts sales to European trucking operators. "The strong rebound of the European truck-tire market reflects increasing orders for new vehicles," Michelin said. The tiremaker, which ranks behind Bridgestone Corp. in global production, reiterated its full-year goal for an increase in operating profit even as rising costs of rubber, steel and oil are likely to lead to a temporarily negative free cash flow in 2011. Michelin said price increases, announced or already implemented, will offset about 80 percent of the estimated full-year costs through higher raw material costs. Michelin ranks No. 40 on the Automotive News Europe list of the top 100 global suppliers, with sales to automakers of $3.65 billion in 2009.